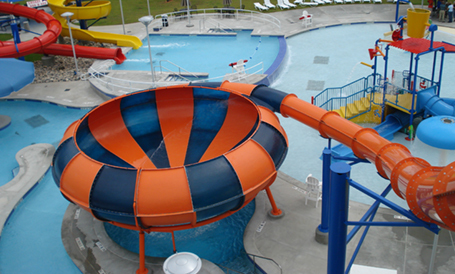 The Orangeburg County Aquatic Center consists of an indoor recreational facility and outdoor water park and will be operated in collaboration with the Columbia YMCA and Orangeburg County. The 45,000 sq. ft. indoor facilities includes a full size 4,000 sq. ft. six lane 25-meter competition swimming pool, 330 sq. ft. therapeutic spa, full court basketball facility, fitness and exercise rooms, child care, food service kitchen, locker and shower rooms. The 7,800 sq. ft. outdoor water park consists of two elevated waterslides with a waterfall flowing into a zero beach entry, a 35 ft. tall bowl slide, a lazy river, a myriad of spray features, hydrotherapy bench seating, an interactive play structure, and a 280 sq. ft. children’s tot pool with a slide and water sprays.